With the arrival of driver-less cars, robotic automation and artificial intelligence, the future is here...and if you & your business aren't ready for it, you risk being left behind. An Oxford University study predicts that within the next 20 years, 47% of all jobs (or 70 million people) could be replaced by technology. 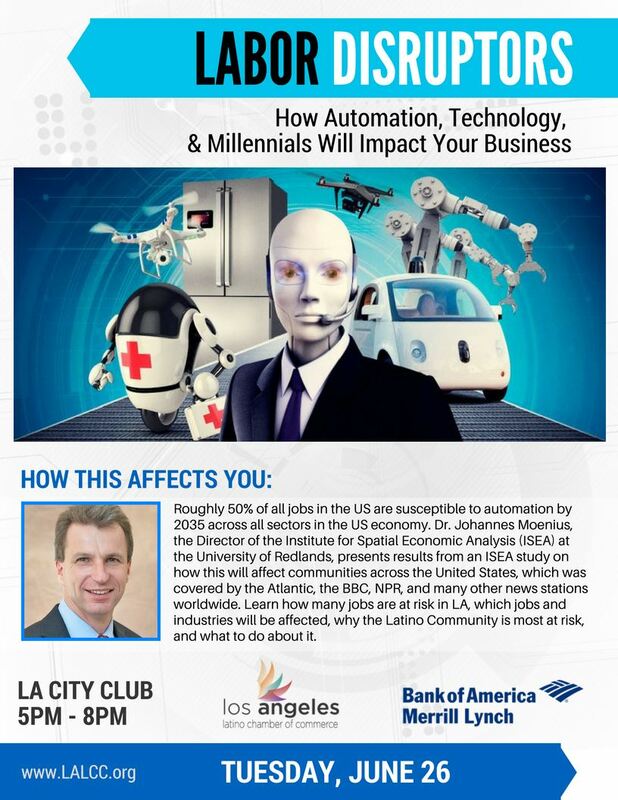 We invite you to join us for our "Labor Disrupted: How Automation, Technology & Millennials Will Impact Your Business" luncheon as we discuss these issues, how they will affect small businesses, and what business owners can do to adapt & survive in an ever changing world. The event will be held on the 51st floor at the City Club in LA. "In order for small business owners to survive in this new era, it is crucial that they learn to adapt"